Just days after copping to an extremely generous settlement with the Securities and Exchange Commission over his infamous “funding secured” tweet, Tesla CEO Elon Musk mocked the agency on Thursday with glee, calling it the “Shortseller Enrichment Commission” (ha ha) and potentially scuttling the entire deal for, I dunno, a joke? Nonetheless, the SEC’s probably hopping mad today, and it totally deserves what happened. The settlement forced Musk out as chairman, and fined $20 million each from him and Tesla. 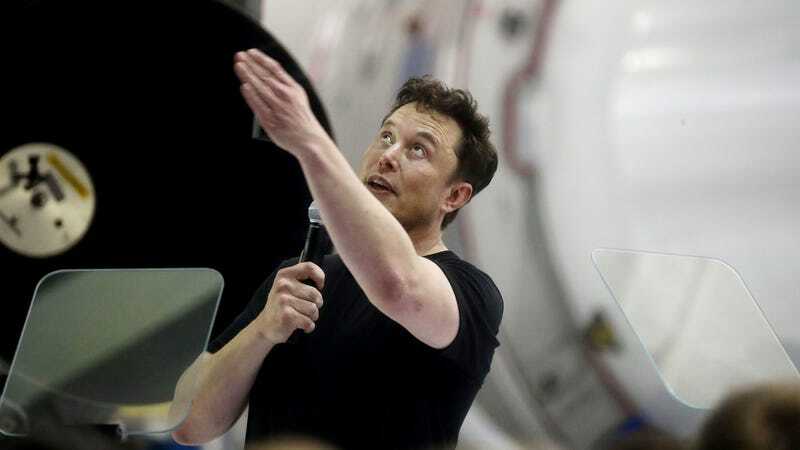 But it was cobbled together in a matter of weeks, after Musk haphazardly, yet definitively, stated on Twitter in early August that he had “funding secured” to take Tesla private. Funding was never secured, though, something that became evident almost immediately. The SEC quickly jumped into action because, well, there are laws that every corporation follows when it comes to deals this monumental—indeed taking Tesla private would be a monumental undertaking—and Musk was effectively laying waste to them. Now, under the SEC, you can’t make false material statements. The legal issue is that you can’t mislead investors by making baseless statements. So the SEC launched an investigation, because Musk had already made the case for it. Tweets, blog posts, more tweets—it was undeniable that he fired off a tweet in haste that sent Tesla’s stock price soaring. Remarkably, the SEC put together a deal that was—no other way to put it—very kind to Musk. It allowed him to stay on as CEO, which is almost universally understood to be crucial to Tesla’s ability to raise money. It maintains an aura of being a company that’s well-ahead of the curve, and would’ve allowed him to come back as chairman in only two years. Tesla walked away, the SEC filed suit, and Tesla’s stock price tanked. So Musk and his company came groveling back and, impressively, the SEC copped to his plea, adding an additional year to his time away as chairman. That was that. Or so it seemed? I get that it’s Musk, and I’m sure at least one member of his rabid fan base is firing up their Kinja burner account right now to hop in the comments section here to call me a bum who has it out for the company. Whatever. The SEC said it filed this suit because Musk’s statements harmed investors, and it’s tasked with looking out for the best interests of investors. “An officer’s celebrity status or reputation as a technological innovator does not give license to take those responsibilities lightly,” Steven Peikin, co-director of the SEC’s Enforcement Division, said about the agency’s case. But the SEC should’ve seen this coming. In under two months, the federal agency tasked with ensuring that publicly-held corporations are kept in check, on behalf of investors, basically gave a CEO of a multi-billion dollar company a free pass to pass off an outright lie with impunity. The $40 million combined fee, even for cash-strapped Tesla, is a drop in the bucket with a billionaire up top. Musk played them. And now both sides have to explain to a judge by Oct. 11 why this settlement merits approval, in the face of Musk openly mocking it. Can’t wait to see what they say.